Please help more athletes stay in the game by supporting the nation’s biggest and oldest non-profit for sports injury Link to article on Triathlete.comresearch, a cause I’ve become very passionate about over the past couple of weeks, the Steadman Philippon Research Institute. Anything helps, please check out my page here. American professional triathlete Mary Beth Ellis was injured in a bike accident on Sept. 9 in Cozumel. Despite severe injuries and the resulting surgery, Ellis is working toward a goal of making it to the start line at the 2013 Ironman World Championship start line. 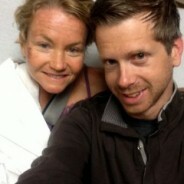 She will be providing updates on her progress exclusively to Triathlete.com. “Hurry slowly” is a motto my coach Brett Sutton applies to everything in triathlon and life. My recovery has been like that—a process where I am slowly but steadily improving each day with my physical therapy. Like any athlete, being patient is not my strongest attribute. But this accident and surgery have forced me to slow down and take things day by day. I have been riding the trainer on my race-ready Cervélo P5 this week and am even able to ride in the aerobars more evenly and comfortably. So while I have only been riding on the trainer, I am very optimistic that things are moving in the right direction. The run has also been on the steady upswing. After the first week of recovery from surgery, I ventured outside and have been able to run pain-free. I am confident that the run should not be a problem for my shoulder as long as I can stay upright and not trip over my own two feet. While there is positive news on the bike and run training, I know the swim will be my biggest obstacle. And progress has been slow. At this time, I am still only kicking and one-arm swimming in the pool. But in my physical therapy, I am slowly working on my range of motion with endless arm circles. I have come a very long way in the last two weeks, but there is still a long way to go over the next 16 days. Ironman is always hard. This one will be my hardest yet. But, I feel lucky. I’ve had the unique advantage of working through a research-based rehabilitation program. I’m fortunate to live near the Steadman Clinic. I want everyone to have this same opportunity… I want to help them help more athletes stay in the game. You can help make people more active by supporting the nation’s biggest and oldest non-profit for sports injury research, a cause I’ve become very passionate about over the past couple week. Anything helps, please check out my page here. Here is the article explaining my choice to race Kona despite my crash and surgery on September 13th. fter a fifth-place finish in her second attempt at the Ironman World Championship in Kona last year, American Mary Beth Ellis was considered a top contender to take the Kona crown this October. Despite a season full of adversity—she had a plantar fascia injury early in the season, was bitten by a rabid dog while training and then crashed while racing at Ironman France (she went on to win)—Ellis had still managed to add several wins to her résumé, including two Ironman titles. She felt like things were finally coming together when she headed to Cozumel for a final block of Kona training with her teamTBB teammates, but one week after her arrival all hopes of winning the Ironman World Championship title were dashed. 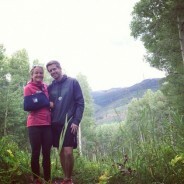 After visiting a local hospital and confirming that her collarbone was indeed broken, Ellis booked the next flight home to Boulder, Colo. and started looking into doctors who could help her reach a full recovery in time to race the 2014 triathlon season without any lingering effects from the injury. At that point, Ellis felt there was no chance of reaching the 2013 Kona start line, but that belief changed when she met with her physician. With Kona back on the 2013 schedule, things moved quickly. The evening of Sept. 12, the same day Ellis met with Dr. Millett for the first time, she was taken into surgery to repair her comminuted distal clavicle fracture (the collarbone break). The end of the bone was actually stuck in her trapezius muscle and resulted in a disruption of coracoclavicular ligaments with a severe deformity in her shoulder. The repair was done using a cutting-edge approach with a specially-designed plate that would allow her to return to activity quickly. Dr. Millett and his team at The Steadman Clinic have put Ellis on a rigorous physical therapy plan that will hopefully get her to the start line on Oct. 12. In addition to her twice-a-day therapy sessions, Ellis has been back in the pool doing some one-arm swimming and water jogging, has spent time on her bike trainer and is hiking to try to retain the fitness she had built up leading into the accident. Though her progress is promising, Ellis, Dr. Millett and her team of physical therapists recognize that competing in any athletic event—let alone the Ironman World Championship—will be a difficult task just four weeks after surgery. While the first leg of the race will be by far the toughest challenge for the usually stellar swimmer, the bike will also come with its own set of challenges. Ellis will stay on the trainer until she leaves for Kona on Oct. 5 and it won’t be until then that she’ll begin addressing the logistical questions presented by the 112-mile ride. Putting weight on her shoulder in the aero position is the most obvious hurdle, but she is equally concerned about how she will be able to grab bottles from aid stations. Although her injuries are different, Ellis says she has reflected on Chrissie Wellington’s 2011 Ironman World Championship win—where she competed with several injuries as the result of a bike crash two weeks prior—as part of her journey to the start line. Though Wellington went on to win that day—and Ellis does admit that was the goal before the accident—the American says that her hopes for a top performance on the Big Island have already been drastically reduced. As part of her journey to the start line, Ellis will be sharing updates on her recovery and training with Triathlete.com. With the race still in question this may seem like a difficult thing to share with the world, but she says it was an easy decision. 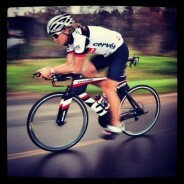 Look for Ellis’ first update later this week and follow her journey at Triathlete.com/MBEKona. First I want to thank Doc, Alex, teamTBB, and all our amazing sponsors who allow me to continue to race and train for a living! Here is my speech after my win at the North American Championships in Mt. Tremblant! I’m going to attempt to speak French now. Promise me you won’t laugh. Bonjour. Merci pour faire une grande course dans cette belle ville. Felicitations, vous etes Ironman! I apologize to the French language for that. Wow, yesterday was hard. But, that’s why we’re here, right? Ironman is supposed to be hard. Everyone in this room does things that most normal people wouldn’t do. Things that most normal people don’t think are possible – Let’s face it, things that most normal people don’t think are sane. But, you are not normal people. You are an Ironman. And becoming an Ironman is not just a hard day. It’s a hard year. Every day, you all have plenty of reasons to give up. To sleep in. To skip that long run. To drink a bit more wine. But, you don’t. You push on. When I was 26, I was diagnosed with osteoarthritis, and I was told I would never run professionally. But, my family believed in me. My coaches believed in me. And, almost 10 years later, I’m here. I didn’t give up. Early this year, when I was sidelined with an injury, attacked by a dog and then thrown from my bike at Ironman France into a ditch, again, the people in my life rallied around me, encouraged me and told me I could still be great. And maybe that alone is what’s most important part of being an ironman. It’s the people that support us – and INSPIRE us – that make that finish line feeling so special. Because you’re never alone in an Ironman. Yesterday, thousands of complete strangers lined the streets for hours, screaming at all of us. That inspires me. I recently met a man from here in Canada who has volunteered at more than 80 Ironmans around the world, including six last year alone. Volunteers inspire me. And no matter how hard each of us are working out there, it inspires me to see the support we give each other on the racecourse. Whether that’s cheering on a top pro or encouraging a struggling athlete, WE inspire each other. But, perhaps the most credit goes to those who endure our crazy antics on a daily basis. My parents, Kathy and Steve are here today. And if you get a chance to talk to them, they’ll tell you stories about driving me an hour each way to swim practice at 5am or tolerating me when I got in trouble for breaking IN to school to use the pool on vacation. And my husband will tell you that we’ve never had a vacation that didn’t involve a seemingly endless search for running trails and pools. The great thing about Ironman, is you don’t leave all that inspiration out there on the course. You share it with the people around you. And you bring all those people across the finish line with you. So, thanks to all of you for making our sport special and thanks to the people around us that making what we do – however crazy it might be – possible. Salmon and Ducks and Lamb Oh My! This is supposed to be a take on the scary yellow brick road journey where Dorothy and her ragamuffin band of friends are all scared of the lions, and tigers and bears! Only my yellow brick road is the one down the aisle to get married in about six months and the animals are the ones one the potential menu. Planning a wedding hasn’t been too stressful yet but I guess I am only halfway there. In fact it has been pretty fun and a nice diversion from the daily grind of training. This week, we went up to the mountains where we will be getting married in December and had the arduous task of tasting the menu and desserts. It was so tough just like I imagine an Ironman must be. We tasted a bunch of starters then of course salmon and duck and lamb followed by three different types of cake. Eric clearly was a fan of the chocolate cake as we had to pry it from his hands just to get a taste. As we move closer to the wedding date it is all getting very real! I have been trying to get a handle on all the wedding details that need to be finalized now as I will be leaving to head to Leysin to rejoin the team in early June. Having the deadline of the last training camp in Thailand and now this one in Switzerland makes it easy as I don’t have time to debate over small decisions for the wedding. I just have to interview a few vendors talk it over with Eric then pull the trigger. There is no time to dilly and dally and it has made me more efficient. But I am now starting to get excited for camp as I read about team members already arriving there. I am sad to be leaving Eric and Mr. Fur but eager to get back smashing sessions with the group and Doc. It is hard training solo at home sometimes and will be nice to have the support and camaraderie. Also, it will be nice to have some time to just relax (aka train like an animal then sleep and eat) and not think about selling my house, moving, or the wedding for awhile. Wildflower lived up to my lofty expectations. Since starting triathlon a few years ago, Wildflower has been on my wish list of iconic must-do races. Unfortunately for me, it was a day of 2nd places: 2nd fastest swim to teammate Jodie by just under a minute, 2nd fastest bike to Leanda by just over a minute, and 2nd fastest run to Mighty Mags by just under a minute again. What did this all add up to? A 2nd place overall but agonizingly only 7 seconds outside of the win. I will be having nightmares and flashbacks about that slim margin for quite some time. The day started well. In the swim, as expected Jodie gaped the rest of us immediately. I lead the rest of the women around the course. I exited the water second woman not as far behind teammate Jodie as at Singapore but still almost a minute down. The bike course in Wildflower is no joke. It reminded me of doing the Alcatraz bike course twice with a 25 mile flat super windy section between the reps. It made the Quassy bike course look flat. After struggling in Galveston, it was nice to have a better bike performance on a course that was challenging and left no place to hide. I just tried to bike smart and save a bit of gas for the run. My nutrition plan went well. First Endurance drink went down smoothly, and I peed early on the bike around mile 35 which was a first (usually my system takes right around T2). I finished the bike about 90 seconds down on Leanda. She pulled away on the flat windy section of road. I definitely need to either get a femur transplant or work on my flat windy TT riding after this race and Galveston. During the first 9 miles of the run, I wasn’t able to take any time back from Leanda. Then suddenly around that 9 mile mark, the gap of 90 seconds started to slowly come down. By the time I got to the final mile, a steep downhill to the finish, the gap was only around 20 seconds. On the final downhill mile, whenever I tried to push it my calves and quads would quiver threatening to cramp up with each footfall. Even still, I made up another 13 seconds to come within 20 meters of Leanda but just couldn’t quite get there. I needed another quarter mile and I could have done it. It is hard to race for just under 4.5 hours and lose by 7 seconds. But Leanda is such a tough competitor, and she made me work hard to take back any time at all. I think we both pushed each other to race harder and were respectively only 5 and 12 seconds off the legendary Julie Dibenator’s course record. Overall, I am happy but will be haunted in my dreams by Leanda running just up ahead unreachable and taunting me. With three races down for 2011, I am excited to have started the year well and even more excited to be a part of the team this year. Thanks so much to all Doc, all the team members, Alex and all our amazing sponsors. 10. No driving! At home, I spent so much time driving here and there to the pool to the track to the store, etc. But here in Krabi, it is nice not to spend so much time sitting in traffic and to do all my commuting by bike. 9. Thai food. While I must admit, I am starting to get a bit tired of Thai food. It has been amazing and when I get home the Thai restaurants will be a pale comparison to what we have here. 8. No housework. Unlike at home where there is always a list of chores to be done, here I don’t have to cook or clean unless I want to for myself. It is nice not to have a list of things I should be instead of resting. 7. The one movie channel. Without any choice in TV, it makes it easy to decide what to watch every night. If I don’t like the one movie option, I just head to bed sooner or read. Instead wasting time with hundreds of stupid TV options I only have one so it is much simpler. 6. Thai massage. For $8 us dollars, you can get an amazing massage here. At home, I pay seven or eight times that for a great massage. 5. Free time. At home, it seems like I am always rung around from one thing to the next without any time to just sit back and relax. But here I manage to get in a god rest between sessions and feel like I am able to make the most of every workout. 4. The Big C. Where else can you eat at KFC, clothes shop, get a donut from Donut Time, and do all your grocery buying. Plus it provides a needed outing when the going gets tough. 3. The Tawantai Hotel! May and the rest of the hotel staff have been so nice and helpful dealing with us and our bikes and smelly shoes. And they have all gone out of their way to make our stay as easy as possible. Plus, living in a hotel has its advantages with laundry and cooking done for us. 2. The Thai people. Everyone here has been so nice and welcoming. Wherever i have gone, the people in Thailand have been so friendly. Even the cars on the road don’t seem to want to run us over as much as they do at home. 1. The Team! I am going to miss training daily with Doc, all my team TBB teammates, and the Swiss crew. It definitely takes your training to a new level when you get the opportunity to swim, bike, and run with so many great athletes. As the triathlon season gets into full swing with training and soon to be racing. I started taking First Endurance HP Optygen daily in early February. I wanted to wait six weeks before reporting on the results. Over the past six weeks, I have been duly impressed with how my body has responded as i have increased my training stress and i think that has a lot to do with First Endurance HP Optygen. After a hectic holiday season, I didn’t rush into training this year but rather used january to just build my fitness and consistency. When I started to get the 2011 season training underway in February, I started using First Endurance HP Optygen. As started to increase volume and intensity, my body broke down but definitely not in the way it did last year. Last year, I became very overtrained and struggled to stay healthy. But for once, I didn’t catch that inevitable winter cold or flu bug but remained relatively healthy. In addition to this, I had consistent training without facing the usual tiredness and soreness that plagued me at least once a week last year. At the end of February, I headed out to Krabi Thailand for a Team TBB camp stocked up with plenty of First Endurance HP Optygen and multivitamin. Unlike last year where I caught something on just about every trip, I managed the 30 hour journey without catching a bug. Then, I jumped straight into intense training over the last three weeks. With the help of First Endurance HP Optygen, I have responded very well to the training load and been feeling great despite the demands I have put on my body. The recovery from training definitely seems faster, and during back-to-back hard sessions and training days my body has been durable and resilient. In years past, I have been inconsistent with my nutrition and wanted to make a change. With the help of First Endurance, I have finally started to take my training, racing, and daily nutrition to a higher level. While I don’t think that First Endurance HP Optygen is the only reason that my training has been progressing so well, I do think it has definitely been an asset. As a pro, it may give me that extra 2 % that i need to win a race instead of finishing 5th. In addition, with professional drug testing, I need to be sure any vitamins and supplements are tested and don’t contain any banned substances. With a company like First Endurance, I don’t have any concerns and trust in all their products. In the scheme of my training program, the easiest workout is taking that First Endurance HP Optygen with my First Endurance multivitamin. Make it one of your goals this year to take your nutrition more seriously. For that, I don’t think you need to look any further than First Endurance.